The synergism between the World Wide Web and fiber optics is a familiar story to researchers of digital communications. Fibers are the enablers of the rates of information flow that make the Internet possible. Currently transoceanic optical fiber cables transmit data at rates that could transfer the contents of a respectable university library in a few minutes. No other medium is capable of this rate of transmission at such distances. With the maturing of mobile portable telephony and the emerging broadband access market, greater fiber transmission capacity will be essential in the early 21st century. 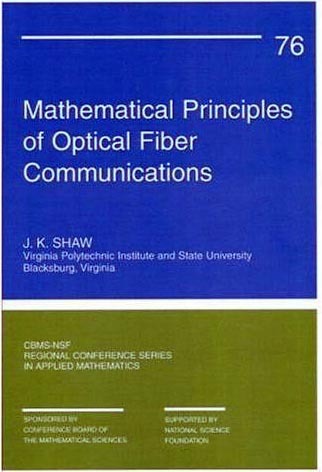 Since the demand for more capacity drives the development of new optics-based technologies, fiber optics therefore remains a vibrant… Mathematical Principles of Optical Fiber Communications is intended to support and promote interdisciplinary research in optical fiber communications by providing essential background in both the physical and mathematical principles of the discipline. Chapter topics include the basics of fibers and their construction, fiber modes and the criterion of single mode operation, the nonlinear Schrödinger equation, the variational approach to the analysis of pulse propagation, and, finally, solitons and some new results on soliton formation energy thresholds. These chapters are written to be as independent as possible while taking the reader to the frontiers of research on fiber optics communications.